Now in its fifth year, Trio Seven is an all extended 7-string ensemble that covers a range of styles, from baroque to romantic, impressionistic to modern. To take advantage of the additional bass and upper range, Trio Seven performs their own transcriptions of works like Mussorgsky’s Pictures at an Exhibition, Debussy’s Prelude to the Afternoon of a Faun, and Ravel’s Ma Mère L’Oye. Pieces familiar to guitar enthusiasts and listeners of classical music receive a richer treatment and clarity in this novel sonic environment. Trio Seven has also developed arrangements with improvisational sections and collaborated with North Indian tabla-player Parteek Bansal. San Francisco eleven-string guitarist Jon Mendle has praised the ensemble, saying, "Trio Seven plays refreshingly innovative arrangements and compositions with great energy and sensitive musicianship. They honor the guitar, yet successfully push it beyond its usual limits." In summer of 2014 Trio Seven completed their debut album, Invocation to the Extended Seven-String Guitar. It consummates their years of transcribing an extensive piano and orchestral repertoire, featuring the austerity of Rachmaninov, the delicate nuances of Debussy, Spanish rhythms of de Falla’s El Amor Brujo, improvisations, and original compositions by Matthew Grasso. They perform throughout Northern California, at colleges, wineries, charity events, weddings and other venues. In the past, they have collaborated with vocal ensembles, Vox Musica and the Vocal Art Ensemble. Trio Seven was founded in 2010 when Davis guitarist and composer Matthew Grasso inaugurated a new ensemble aesthetic with his composition 7th Creation. 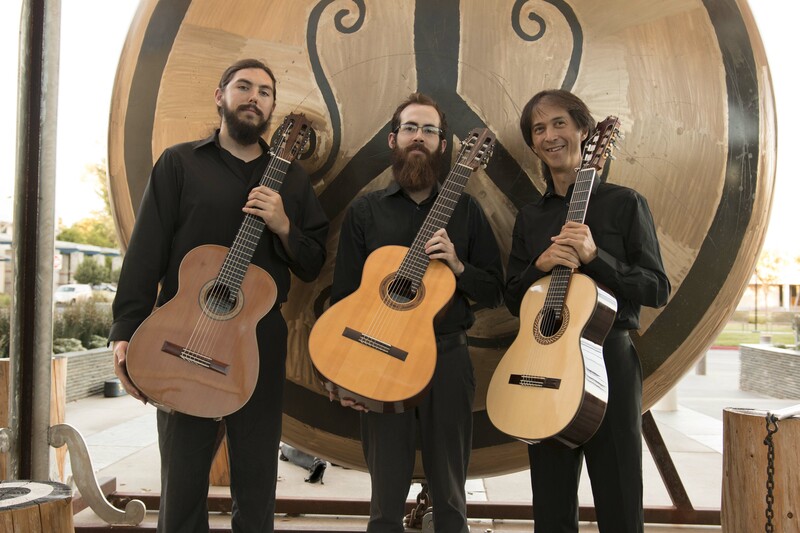 A unique collaboration featuring three extended 7-string guitars, Trio Seven seeks to expand the repertory of the instrument through transcription and original works. Its current members are Matthew Grasso, Matthew Foley, and Harry Stoddard. For up-to-date information regarding bookings, visit our Concerts page. Matthew Foley has made guitar playing his life's devotion for over a decade. He has studied with Matthew Grasso continually during this time. Matthew Foley earned a bachelors of music degree from California State University, Sacramento, and at present, is a graduate student there studying under Dr. Richard Savino. He has provided guitar instruction at Sacramento City College, Live Music Center, Natomas School of Music, Newsongs School of Music, Pacific Institute of Music, Young Artists Conservatory, Music Matters, and privately. He has played in masterclasses with internationally known guitarists: James Kline, Marc Teicholz, Adam Holzman, Mark Delpriora, Benjamin Verdery, Paul Galbraith, Massimo Delle Cesse, and Eliot Fisk. Matthew has performed live on Vacaville's television channel, "Access27." During summer 2014, Matthew completed work with Trio Seven on their first album, Invocation to the Extended Seven String Guitar, and was featured on Matthew Grasso's 2010 album, Past Present Future. He frequently performs in the Sacramento area as a soloist, with Trio Seven, Camerata Capistrano, and other ensembles. Matthew plays an extended seven-string guitar built by Waylin Carpenter. For thirteen years, Harry Stoddard has been exploring music, from the orchestra to the classical guitar, to the elegant simplicity of Just Intonation. In 2008 he began studying 7-string classical guitar with Matthew Grasso, and in 2013 he participated in a masterclass with Paul Galbraith. He teaches privately at the Young Artists Conservatory of Music and in the Music Matters program in Fairfield. His contributions to the 7-string solo and trio repertoire include transcriptions of Bach, Mozart, Mussorgsky, Ravel, Debussy, and Lili Boulanger. He performs as a soloist in the Sacramento area and in Northern California with Trio Seven, an all extended seven-string guitar ensemble dedicated to pushing the limits of classical guitar through transcriptions of orchestral and piano works, as well as original compositions and improvisations. He can be heard on Trio Seven’s debut CD, Invocation to the Extended Seven-String Guitar. Born in 1972 of Chinese and Italian ancestry, Matthew Grasso began playing guitar at age twelve. He attended the San Francisco Conservatory of Music where he studied with Scott Tennant, Dusan Bogdanovic, and Lawrence Ferrara and participated in master classes held by artists including Eliot Fisk, David Russell, and the L.A. Guitar Quartet. Matthew complemented this training by studying the classical music of North India at the Ali Akbar College of Music with the late sarod master Ustad Ali Akbar Khan. Matthew Grasso, classical guitarist, composer, arranger, musical instrument innovator and improviser, performs on an extended 7-string guitar, 25-stringed raga guitar, and a 14-note octave just intonation guitar. The extended 7-string has an additional bass string and 22 frets on the first-string. This instrument has one octave more in melodic range and greater harmonic/contrapuntal possibilities than the traditional 6-string guitar. The 25-stringed raga guitar is a hybrid of an extended 7-string and the sarod, an Indian instrument. There are 7-playing strings, 12-sympathetic strings, 2-chikari, 4-jawari strings, and a just intonation fingerboard. The 14-note octave guitar has 6-strings and is set in a 7-limit just intonation microtonal tuning system. Matthew has worked with luthiers Greg Byers, Scott Richter, and Waylin Carpenter to design these instruments, which provide myriad possibilities for transcribing, composing and improvising. In his quest for new guitar literature, Matthew has contributed to the classical guitar repertory by transcribing numerous works for solo extended 7-string guitar, including Barber's Adagio for Strings; Ravel’s Mother Goose Suite; Debussy's Prelude to the Afternoon of a Faun; Rachmaninoff's Symphony no.2; Bach's Chaconne; and other works in the pop vocal genre from the 60’s and 70’s. Through his understanding of musical systems of the east and west, he has created a flexible and creative voice in improvisation and has developed a unique style of rendering classical ragas. In addition to keeping with Indian tradition, he has conceived new talas (rhythmic cycles) such as 10 ½, 27 ½, 9 ¼, and 5½, as well as original ragas (melody forms). This music can be heard on his 25-stringed raga guitar with his group, Nada Brahma Music Ensemble. Matthew performs and lectures throughout Northern California. He was a featured soloist with the Camellia Symphony, Solano Symphony, Davis High School String and Symphony Orchestra, American River College Orchestra, Solano County Youth Symphony and Auburn Symphony Chamber Players under the baton of the late Maestro Michael Goodwin. His recordings include six CDs: Intimate Settings (1995), Echoes of a Lake (1999), Moussorgsky’s Pictures at an Exhibition (2001), Music for the Extended 7-String Guitar (2006), The Five Deadly Talas (2008) and Past, Present, Future (2010). In addition to recordings, Matthew has published, Playing the 7-String Guitar in Mel Bay's Guitar Sessions, as well as his own compositions and transcriptions. Matthew Grasso is the high priest at the 7-string guitar church in Davis, California. Eric Rasmussen began studying classical guitar with Matthew Grasso in 2003 and began playing the 7-string classical guitar in 2005. He has performed a variety of solo and ensemble classical guitar works throughout Northern California, including performances with the Indian Classical Fusion group, the Nada Brahma Music Ensemble. Eric has been active in the Sacramento Guitar Society and played in a master class with Jim Kline. Eric has performed in concert with the American River College Orchestra and Solano Youth Symphony. His guitar arrangements include Franck's Chorale (for 7-string duo), Satie's Gymnopedie No. 1, Beethoven's Moonlight Sonata (first movement), and the Aria from Bach's Goldberg Variations. Eric has also performed on radio, TV, and appears on recordings with Nada Brahma and Matthew Grasso.